The Charismatic Movement is the international trend of historically mainstream congregations adopting beliefs and practices similar to Pentecostalism. Fundamental to the movement is the use of spiritual gifts (charismata). Among Protestants, the movement began around 1960. Among Roman Catholics, it originated around 1967. Pentecostalism began in the early twentieth century. Its doctrinal distinctive involved a dramatic encounter with God termed baptism with the Holy Spirit. The evidence for having received this experience was speaking in tongues. American Lutheran minister Harald Bredesen coined the term "charismatic" in 1962 to describe what was happening in mainline Protestant denominations. Confronted with the term "neo-Pentecostal", he preferred to call it "the charismatic renewal in the historic churches". Before 1955 the religious mainstream did not embrace Pentecostal doctrines. If a church member or clergyman openly expressed such views, they would (either voluntarily or involuntarily) separate from their existing denomination. 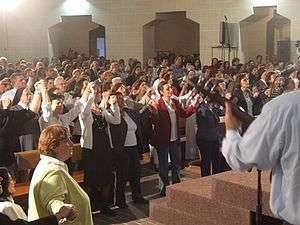 The charismatic movement represented a reversal of this previous pattern as those influenced by Pentecostal spirituality chose to remain in their original denominations. The high church wing of the American Episcopal Church became the first traditional ecclesiastical organization to feel the impact of the new movement internally. The beginning of the charismatic movement is usually dated to Sunday, April 3, 1960, when Dennis J. Bennett, rector of St Mark's Episcopal Church in Van Nuys, California recounted his Pentecostal experience to his parish, doing it again on the next two Sundays, including Easter (April 17), during which many of his congregation share his experience, causing him to be forced to resign. The resulting controversy and press coverage spread an awareness of the emerging charismatic movement. The movement grew to embrace other mainline churches, where clergy began receiving and publicly announcing their Pentecostal experiences. These clergy began holding meetings for seekers and healing services which included praying over and anointing of the sick. The Catholic Charismatic Renewal began in 1967 at Duquesne University in Pittsburgh, Pennsylvania. Charismatic Christians believe that the gifts (Greek charismata χάρισμα, from charis χάρις, grace) of the Holy Spirit as described in the New Testament are available to contemporary Christians through the infilling or baptism of the Holy Spirit, with-or-without the laying on of hands. Although the Bible lists many gifts from God through His Holy Spirit, there are nine specific gifts listed in 1 Corinthians 12:8-10 that are Supernatural in nature and are the focus of and distinguishing feature of the Charismatic Movement: Word of Wisdom, Word of Knowledge, Faith, Gifts of Healing, Miraculous Powers, Prophecy, Distinguishing between Spirits, Speaking in different Tongues (Languages), and Interpretation of Tongues. The movement led to the creation of independent evangelical charismatic churches more in tune with this revival of the Holy Spirit. Calvary Chapel Costa Mesa, California is one of the first evangelical charismatic church in 1965. In the United Kingdom, Jesus Army, founded in 1969, is an example of the impact outside of the United States. Many other congregations were established in the rest of the world. Larry Christenson, a Lutheran theologian based in San Pedro, California, did much in the 1960s and 1970s to interpret the charismatic movement for Lutherans. A very large annual conference was held in Minneapolis during those years. Charismatic Lutheran congregations in Minnesota became especially large and influential; especially "Hosanna!" in Lakeville, and North Heights in St. Paul. The next generation of Lutheran charismatics cluster around the Alliance of Renewal Churches. There is currently considerable charismatic activity among young Lutheran leaders in California centered on an annual gathering at Robinwood Church in Huntington Beach. Richard A. Jensen's Touched by the Spirit published in 1974, played a major role of the Lutheran understanding to the charismatic movement. Prominent Reformed charismatic denominations are the Sovereign Grace Churches and the Every Nation Churches in the USA, in Great Britain there is the Newfrontiers churches and movement, which leading figure is Terry Virgo. Since 1967 the charismatic movement has been active within the Roman Catholic Church. In the United States the Catholic Charismatic Renewal was focused in individuals like Kevin Ranaghan and others at the University of Notre Dame in Notre Dame, Indiana. Duquesne University in Pittsburgh, which was founded by the Congregation of the Holy Spirit, a Catholic religious community, began hosting charismatic revivals in 1977. ↑ Menzies & Menzies 2000, pp. 38–9. ↑ Menzies & Menzies 2000, pp. 38–41. ↑ Menzies & Menzies 2000, pp. 43–4. 1 2 Menzies & Menzies 2000, p. 39. ↑ Poloma, Margaret M; Green, John C (2010), The Assemblies of God: Godly Love and the Revitalization of American Pentecostalism, New York: New York University Press, p. 64, ISBN 978-0-8147-6783-2 . ↑ Saunders, Theodore ‘Teddy’; Sansom, Hugh (1992), David Watson, a Biography, Sevenoaks: Hodder, p. 71 . ↑ Menzies & Menzies 2000, p. 40. 1 2 3 Masters, Peter; Whitcomb, John (Jun 1988). Charismatic Phenomenon(ISBN ). London: Wakeman. p. 113. ISBN 9781870855013. ↑ "Anglican Pioneer in Renewal". Telus. Retrieved 2008-01-31. ↑ "Understanding the Charismatic Movement". The Exchange - A Blog by Ed Stetzer. Retrieved 19 July 2015. ↑ "Presbyterian and Reformed Churches". tateville.com. Retrieved 19 July 2015. ↑ Suenens, Léon Joseph (1983). Renewal and the Powers of Darkness (Malines document). Darton, Longman & Todd. ISBN 978-0-232-51591-6. ↑ Barrett, David, "Christian World Communions: Five Overviews of Global Christianity, AD 1800–2025", International Bulletin of Missionary Research, 33 (1): 25–32 . ↑ McDonnell, Killian; Montague, George T (1994), Christian Initiation and Baptism in the Holy Spirit: Evidence from the First Eight Centuries, Collegeville, MN: Michael Glazier Books . ↑ "Study Seminar organized in Brazil", L'Osservatore romano (Italian ed. ), p. 4, November 4, 2005 . ↑ Ruffin, C Bernard (1991), Padre Pio: The True Story, Huntington, IN: Our Sunday Visitor, pp. 312–3 . Wikimedia Commons has media related to Charismatic Renewal.